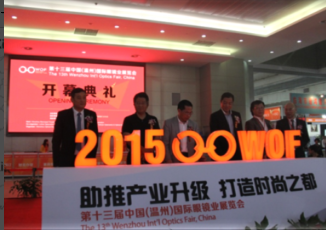 The 14th Wenzhou Int’l Optics Fair, China (WOF 2016 for short) organized by Wenzhou Optical Association and Zhejiang Donnor Exhibition Center, in collaboration with the Wenzhou Municipal People's Government and Zhejiang Optometric & Optical Association, will be held on 8-10 May, 2016 at Wenzhou Int’l Convention & Exhibtion Center, China. More than 400 exhibitors will appear at WOF 2016 to display their most fashionable and advanced products, covering about 1,000 booths and 25,000 sqm exhibiting area and are estimated to attract more than 20,000 visitors from all over the world. 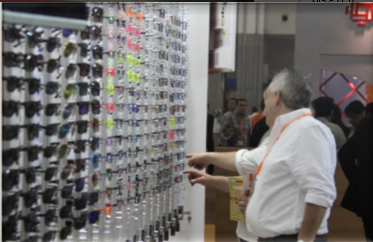 WOF 2016 will present quality products and high competitive technology in optics industry, such as sunglasses, sports spectacles, reading glasses, lens & optical blanks, glasses frames, glasses cases & accessories, lenses manufacturing & processing machineries, raw materials for glasses, view tester, instruments for optometry & ophthalmology, contact lens & ophthalmic products, optical electroplating equipments & corresponding materials, glasses retail stores, glasses store fittings & furniture, chain glasses enterprises, etc. Wenzhou is the Glasses Production Base in China providing medium and high-end eyewear manufacturing and OEM service. Through 30-year's development, it has already owned approximately 1,000 manufactories, with over 100 thousand staff. Its export reached nearly 800 million USD and Ouhai District of Wenzhou is titled as "National Glasses Foreign-trade Reform & Upgrade Demonstration Base". 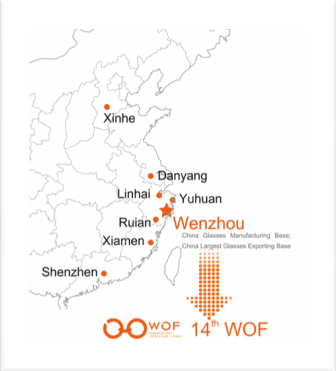 The overwhelming advantage of WOF is the attendance of China Glasses Industrial Clusters including 4 China Glasses Production Bases – Wenzhou, Danyang, Shenzhen and Xiamen. As well as China Glasses Spare Parts Production Base – Yuhuan, China Sunglass Manufacturing Cluster – Linhai, China Glasses Packing Manufacturing Cluster – Xinhe and Hometown of Glasses –Yingtan. After its first successful debut in 2003, WOF has held 13 sessions. With13-year's experience, WOF is more mature in exhibitors, visitors, service and invitation. 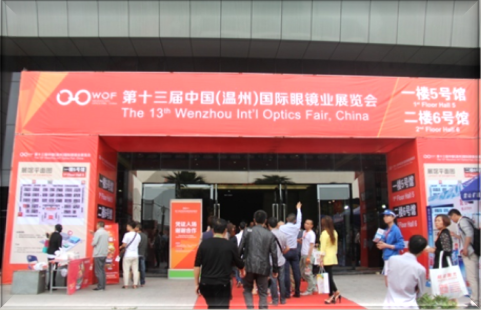 In Wenzhou and its surrounding areas, the labor force is rather accessible and cost effective which leads to the competitive price of optical products. Though the price is not very expensive, with the increasing mature technology and world-class machines, the products are produced with best quality, which respect the available consumer safety and environmental standards. Oversea visitor is a crucial part of WOF through its development. The Organizer of WOF pays the highest attention to them and always tries to do the best service for them. As last years, this session, the Organizer continues to provide 3-Day Free Hotel during the fair to Oversea Visitors, including visitors from Taiwan, Hong Kong and Macau. 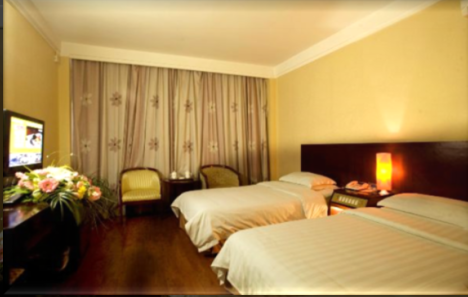 Visitors who want to enjoy free accommodation, please contact Ms. Lacey at optics@donnor.com for application.The free hotel is only available after application and the deadline for it is April 15, 2016. For more info about WOF 2016, please visit www.opticsfair.com. Pre：Merry Xmas & Happy New Year!